The following is a guest post by Amelia Bellamy-Royds. I've always enjoyed the "duotone" effect in photos. In Photoshop, you can create them by converting an image into grayscale mode, then into duotone. So the lights are "mapped" to one color, and the darks another. Not only does it look cool, but images with less colors are smaller in file size and thus good for performance. When I saw Amelia playing around with this programatically through SVG on CodePen, I asked if she'd be up for teaching us through a guest post. Lucky for us, here it is! Graphical effects—first in SVG, now in CSS—are changing that. You can apply Photoshop-like filters or blended layers right in the browser. Which means you can use a single image file and present it in multiple ways as the user interacts with it. It also means you can have a lot of fun with a boring-old black and white photo. The easiest-to-use graphical effects are the shorthand filter functions. You apply them with the CSS filter property The browser manipulates the appearance of the corresponding element before painting it to the page. Filter functions are supported prefix-free in Firefox since version 35 (stable release in January 2015). They have been supported with the -webkit- prefix in Safari, Chrome, and Blink-based Opera for a few years now. For a full description of the available filter functions (with examples! ), check out the Almanac page on the filter property. You can apply a series of filters as a white-space separated list. Filters create a stacking context. A filter is applied to an entire element (including text, background images, and all its child content), after layering them together. There are still a number of buggy edge cases in browsers, like what happens when there are fixed-position child elements or hidden overflow. An easy and useful trick is to take a color image and convert it to black and white, using grayscale(100%) or saturate(0%). The following demo uses that to create monochrome profile pictures for a pair of smart cookies. The filter is removed on hover/focus to reveal the full color image. To compensate for the loss of color contrast and vibrancy, the overall brightness and contrast of the image is increased using the (conveniently named) brightness() and contrast() filter functions. It even adds a short transition to fade the colors in and out. See the Pen CSS Filters Gray -> Color by Amelia Bellamy-Royds (@AmeliaBR) on CodePen. This is all well and good. Take a color image, tell the browser to make it gray. Selectively reverse for user-delighting interaction. But what if you could do the opposite? What if you could start with a grayscale image and tell the browser to give it color? A grayscale JPEG image is usually between 5-25% smaller in file-size than the equivalent color photo (it depends on the photo and the compression ratio—JPEG compresses color channels much more than the brightness details). For a lossless image format such as PNG, the change in file size can be much greater. When performance matters, those extra kilobytes could count. Imagine if you had a page full of profile pictures. The user is only ever going to see some of them in color, so why use up their data plan sending the color photos? Filters also take CPU to process and memory to store the result. Wouldn't it be better to only filter the hovered photo, and leave the rest as normal? Finally, you have to think of the impact on browsers that don't support CSS filters. Do you want all color or all grayscale as the fallback? There is only one shorthand filter function that can add color to a grayscale image: sepia(), which gives whites and grays a yellowish tinge. On a color image, it applies an implicit conversion to a luminance-based grayscale first. It also increases the overall brightness and contrast, although not as much as the previous example did with separate filters. The demo below looks almost identical to the previous one, before you interact with it, but this time the images are actually saved as grayscale JPEGs. A sepia-toned effect is applied to add a little (false) color on hover. See the Pen CSS Filters Gray -> Sepia by Amelia Bellamy-Royds (@AmeliaBR) on CodePen. It's a neat effect, but I can't say I'm in love with the particular shades of yellow-beige that sepia tone implies. Can't I pick my own colors? I can. Just not with a shorthand filter function. These shorthand functions can all also be written longhand, as SVG filter elements. If you want more custom control, you just have to create the equivalent SVG filter and customize it yourself. Within SVG, SVG filters are supported on most modern browsers, including Internet Explorer 10 and 11. Note the "within SVG". SVG filters are not supported IE or Edge (yet) on HTML content. Users of IE9 and Opera Mini won't see the effect. (There are also a few bugs and limitations in other browsers, but none of which affect the color filters discussed here.) For applying SVG filters to non-SVG content, Firefox and the latest versions of Chrome and Opera support it in the unprefixed filter property. Safari and older Blink support it in the prefixed -webkit-filter property. The sepia() shorthand filter function is defined in SVG filters using the <feColorMatrix> operator. 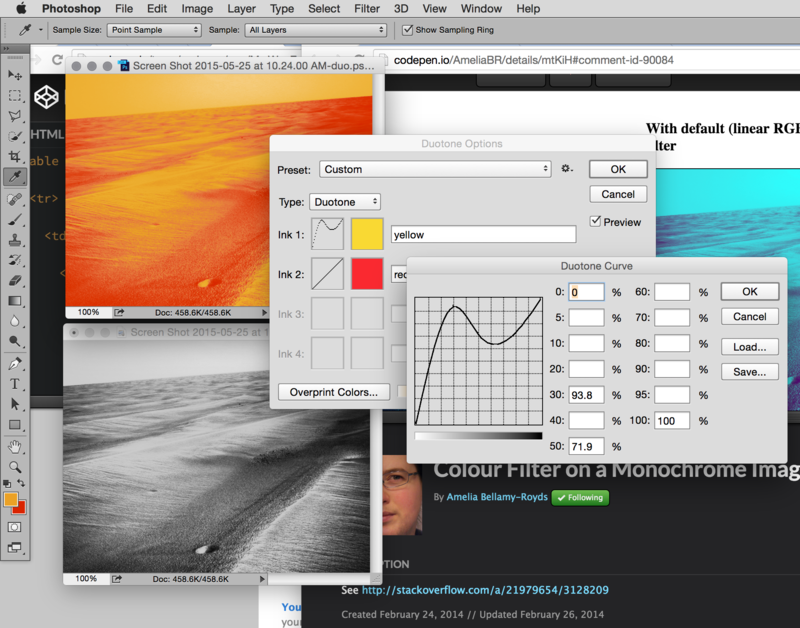 To create your own colorizing effect, therefore, you can create a color matrix filter and adjust the parameters. Easy-peasy, right? Just tweak a couple numbers here, a couple numbers there, and… realize you have absolutely no clue what you're doing. Time for a diversion into the wonderful world of matrix algebra. The first thing you need to understand about <feColorMatrix> is that the list of numbers in the values make up a matrix. Specifically a five-column, four-row matrix as indicated above through the power of preserved whitespace. The output color for any pixel is created by multiplying that matrix against the input pixels. A matrix is basically a shorthand way of describing a set of algebraic equations. Instead of using letters like x and y to describe the variable amounts, you use the position within the rows and columns of the matrix. A multi-part value—like an x,y point or an RGBa color—can be represented by a single-row or single-column matrix, otherwise known as a vector. When you multiply a matrix and a vector, you are substituting in the values from the vector for variables in the matrix, and then adding up the result for each equation. The color matrix filter is created by representing the RGBa input color as a vector where the values on each channel have been scaled to the range 0–1. That vector is multiplied by the matrix, and the result is then converted back to create the RGBa output color. Each vector and the matrix are given an extra row/column so that you can shift the colors by a fixed amount if you need to. The last row works out as 1=1, so you can safely ignore it. It is also ignored in the <feColorMatrix> attributes, which only specify the first four rows of the matrix (20 numbers total). For the other rows, you are creating each of the rgba output values as the sum of the rgba input values multiplied by the corresponding matrix value, plus a constant. If you haven't figured out my naming convention yet, Nra is the proportion of the original Red-channel that goes into the output Alpha channel, while Ca is the constant added to the Alpha channel. The fifth row, as mentioned before, is excluded because it never changes. The matrix does two things: it flattens a colored image to grayscale (with luminance adjustments), and then it tints that color yellowish. The alpha channel does not change: the output A2 value is exactly 1 times the input A1 channel. The color is therefore rgb(135.1%, 120.3%, 93.7%). Now, wait, you're saying "hey, you can't have rgb values greater than 100%." You can't, but you can. They get clamped down to 100%, and so the result is that white parts of the input image get turned into a pale yellow. If you reduce the input values slightly, you won't actually see a reduction in the red and green channels until the output drops below 100%, so you'll still get yellow, but not as pale (since the blue channel will visibly drop off). In other words, it would be an orangish-yellow-gray, approximately rgb(68%, 60%, 47%). Before we get back to the demos, I should inject a cautionary note. You might be under the impression that in order to create a RGB input vector with a value of 0.5 in each channel, you should use rgb(50%, 50%, 50%) or #888 or gray. You would be right if you were using an <feColorMatrix> filter, but wrong if you were using the sepia() shorthand function. This is because the shorthand filters all use the sRGB color model to scale the input colors into the values used in the calculations. SVG filters, in contrast, by default use a direct mathematical conversion between the input RGB values and the values used in the matrix mathematics. This can be controlled with the color-interpolation-filters property, which can be set on the filter as either an attribute or an (inheritable) CSS property. The two values for the property are linearRGB and sRGB. The rest of the examples are going to use sRGB. The sRGB mode most effectively preserves the perceived brightness differences between parts of the input image. But it has a significant impact on the result, so if you are using the same numbers and getting very different effects, that might be it. It also means that the colors can't easily be calculated by hand. It is particularly tricky to define filters that exactly create a particular output color for medium grays. If you're playing around with filters in the browser, that's usually not a problem. However, if you're trying to match particular colors in the rest of your web design, you may want to test out color-interpolation-filters: linearRGB;. The sepia filter creates a monochrome effect. The black-to-white grayscale values in the input are mapped to black-to-lightyellow instead. It's not a perfect monochrome effect, because of the clamping effect on the over-saturated red and green channels, but it is something like it. Here's what it looks like. I've commented-out the bits that add the hover effect, so you can just see the end result. See the Pen SVG Filters Gray -> Monochrome Color by Amelia Bellamy-Royds (@AmeliaBR) on CodePen. The numbers in the question mark positions don't have any effect when the input is black. They control what happens for the rest of the image. If they were all zero, every input pixel would have the same constant output, and the entire image would end up deep blue. There are much easier ways to create a solid deep blue region in CSS, so that's probably not what you want. We want the output color to be white (all ones) when the input is white, so you might think you could replace each question mark with a 1. However, you've still got those constants added to every pixel. Once you add them in, you'll have an over-exposed image with most of the lighter details washed out. See the Pen SVG Filters Gray -> Invert Monochrome Color by Amelia Bellamy-Royds (@AmeliaBR) on CodePen. So far, we've used color matrix filters to create both a black-to-color monochrome and a color-to-white monochrome. Why not color-to-color? Of course! That's technically no longer a monochrome image, though: in printing, the effect is known as duotone. The approach is the same as for the color-to-white matrix. You set the constants (the last column) to the value you want for the black parts of the input image, and then set one of the other columns to the difference between that and the color you want the white parts to display as. The white points will end up as rgb(95%+5%, 65%+15%, 15%+50%). Which is the same peachy-pink as before. However, all the intermediary grays will be somewhere in between that color and the deep blue. See the Pen SVG Filters Gray -> Duotone Color by Amelia Bellamy-Royds (@AmeliaBR) on CodePen. The next demo uses more saturated colors to show off the use of negative color shifts and color values that fall outside the 0–1 range. See the Pen Psychedelic SVG Filters Gray -> Duotone Color by Amelia Bellamy-Royds (@AmeliaBR) on CodePen. While looking at that demo, you might be surprised to note that the box-shadow on the image also turns purple. Filters are applied after all other CSS effects, except for clipping and masking. If you want to create a shadow that doesn't change color with the filter, you'll have to use a filter to create it. You could do this within the SVG filter, or you can do it with the shorthand drop-shadow() filter function, which takes the same parameters as the text-shadow() property. It's not quite the same as a box shadow (you can't use a "spread" parameter, and it is affected by any transparent regions in the content), but in this case it's darn close. See the Pen v2: Psychedelic SVG Filters Gray -> Duotone Color by Amelia Bellamy-Royds (@AmeliaBR) on CodePen. If you've made it to this point, you're probably a little bored of my grinning face(s), so let's try a different example. I forked the next pen from an example Chris Coyier created for a post on layering text over top of images. To keep the text readable, you need to reduce a lot of the contrast and intensity of the image. The technique Chris uses (and which is very useful) is to layer a semi-transparent single-color gradient over top of the colored image. The net result for many images is something that doesn't look that much different from my colorized grayscale images. In the demo, the first version of each slide has a colored background image, while the second version is a duotone-colored grayscale. See the Pen feColorMatrix - Tinted grayscale hero images by Amelia Bellamy-Royds (@AmeliaBR) on CodePen. The duotone image is somewhat flatter, with lower contrast than the shaded color image. That is not necessarily a bad thing, given the desire to keep the text legible. But it might not be what you want. The main limitation to the duo-tone approach I've been using so far is that, in order to create blue mid-tones, I needed to use dark blue values for my black point and light blue values for my midpoint. In order to break free of this limitation, we have to break free of linear algebra. We need an exponential improvement on our colorizing abilities. By exponential improvement, I mean mathematical exponents. (What? You thought we were done with the math? Not yet!) In particular, I mean a gamma-correction factor. A gamma correction is a common manipulation in digital imagery, to create a non-linear change in brightness or color intensity. Applied equally to all color channels, it increases or decreases the brightness of the mid-tones without over- or under-exposing the lights and darks. Applied to each color individually, it can shift the overall color balance of an image, without shifting blacks and whites. The <feColorMatrix> duotone effect can be thought of as picking two colors in the sRGB color cube, and drawing a straight line between them. All the shades of gray are mapped to a value along that line. If you applied color-specific gamma factors to that line, you could create a curved line through the three-dimensional color space. It can start at black and end at white, but still shift through reds, blues, or greens instead of pure grays. You can't apply gamma factors with matrix multiplication. However, you can with the <feComponentTransfer> filter. It supports a variety of different functions on color channels, but only one channel at a time. Each channel has its own element to describe the conversion function that will be applied: <feFuncR>, <feFuncG>, <feFuncB>, and <feFuncA>. Each function element has a type attribute to describe the math that will be used, and then various other attributes give the parameters for each type. When an input color channel is 0, the output is also 0 (0 raised to any power is still 0). When an input channel is 1, the output is also 1 (1 raised to any power is still 1). For all the in-between values, exponents less than 1 increase that color in the output, and exponents greater than 1 decrease the color in the output. This is the inverse of how gamma factors are defined in many software programs, which use an exponent of 1/gamma. See the Pen SVG Filters Gray -> Non-linear Color by Amelia Bellamy-Royds (@AmeliaBR) on CodePen. The constant offsets still set the output color for input black pixels. The sum of those constants plus the amplitude factor sets the output color for input white pixels. The exponents define how your color line will curve in between those two points. You could try to figure it out the exact values from the equations, but it is probably easier to open it up in a live editor and fiddle with the numbers until it looks right to you. See the Pen feComponentTransfer - Tinted grayscale hero images by Amelia Bellamy-Royds (@AmeliaBR) on CodePen. Can you tell which one is the real color image? Could you tell if they weren't side by side? Not all images will be this easy to reproduce, of course. You can never get a full multi-colored image from a grayscale one. The skyscrapers work because the original image had very limited color variation. But, that limited color variation was the main reason that the image was so suitable as a backdrop. If that's the effect you're trying to go for, you can definitely create it from a grayscale photo. As I mentioned at the top of the post, support for SVG filters on HTML content goes back a couple years on Firefox and (with -webkit- prefixes) Chrome, Opera, and Safari. It is expected to also be supported in Microsoft Edge. But in the meantime, there are still a large chunk of web users out there without beautiful filter goodness for their web page experience. Support for SVG filters within SVG content, however, is much better (IE10+). And SVG content can include embedded JPEG images. You can therefore quickly improve you browser support by moving the images you want to filter into inline SVG tags. It requires a little extra markup, but the end result looks the exact same. See the Pen IE10+ Tinted grayscale hero images by Amelia Bellamy-Royds (@AmeliaBR) on CodePen. Nonetheless, this still isn't universal support. If your boss or client insists that the website must look the same on every browser including Internet Explorer 8, you'll be doing some manual or server-side image processing to create colored versions of all the effects, and some scripting (client or server side) to swap them in. For more pragmatic-minded fallbacks, your main concern is whether the interface is usable and text is legible. For the grayscale-to-color hover effect, that can be as simple as making sure there are other interface cues that something is interactive. For text overlaid on an image, it is a little trickier. Without the filter, the grayscale images used in the skyscraper demo are too bright and high-contrast to be able to read the text. One solution would be to darken the images at the time they are converted to gray, so that the filter only handles the colorizing. Other approaches would require browser-support testing followed by changing other style properties. Unfortunately, client-side testing for filter support is a little tricky. You can't just test for whether the property is supported, since that does not tell you if it will have any effect on HTML elements. The CSS @supports rule fails for the same reason. You can test whether the shorthand functions are supported (by setting the filter style of a dummy element to the function string and seeing if it is still there when you read back the computed style), or you can test whether filters are supported in SVG (by confirming that you can create an SVG element, and that it has the element.style.filter property), but you can't directly test whether filter: url(#blur) will have any effect when declared on a <div>. Filters are only one of the new graphical effects that are changing what is possible with images on the web. Blending modes and masking will have an equal impact. Both the monochrome and duotone color effects can also be achieved with blending and with masking. As with most things in CSS (and the web in general), there are many ways to achieve a given effect. When deciding which approach to use, consider your support and fallback options, as well as the impact on your code maintainability. Blended backgrounds are convenient in that they can be created without any extra markup. But an SVG-filtered image within an inline <svg> has the best support. I mean if we’re going to be pedantic shouldn’t “good” be “better”? Also, while an image with reduced colors may be better for performance, let’s not overlook the performance requirements for applying these CSS transformations. While the CSS route is certainly more versatile it may be worth considering whether the solution is better when it comes to flat out performance comparisons. Both pedantic grammar points duly noted. Fewer colors can be better for performance. Yes, there are certainly trade-offs. If you are only using one version of the image, then it will often be best to create it once exactly how you want it and let users download that. So the skyscraper example of a tinted background image is maybe more hypothetical than practical. The real benefit comes when you want to manipulate images dynamically, or re-use existing images with new graphical effects. Then the ability to re-use a cached file instead of downloading a new one will have an impact. And of course, you should consider whether the effect you gain is worth the computational requirement, as I discuss when introducing the idea of selectively using filters to color a grayscale image versus using filters to make all the images gray and the selectively revealing the true color. To Mnesikles: Poetic justice for people like you is to be vaporised outside the nuclear shelter as you stop to carp at spelling mistakes. Any idea to change CMYK Colors? CMYK is for print, not tv/monitor displays… it really doesn’t have any place on the web other than as a downloadable image file for use in printing. The filter manipulations all assume an RGB color model. The author has explained the concept beautifully and we have Grammar Nazis pointing out grammatical mistakes. Seriously Guys, languages are just meant to communicate. If there is clarity in someone’s explanation, mission accomplished. This woman takes the time, and makes the effort to write an interesting and informative article, and all you people can do is criticize her. You really are a bunch of ungrateful misogynistic poo heads. Glad you all found the article useful. Let’s keep the tone respectful here. Suggesting a correction, even a minor one, does not make someone a Nazi or a poo head or deserving of nuclear vaporization. Honestly, I would have rushed to make those suggested corrections if they were in my text as opposed to Chris’ intro. Great article, thanks. Shame on you, pedants.